I stood up to worship because that’s what the worship leader asked us to do, but my heart wasn’t in it. Inside, I was wrestling with God. I had been feeling a blockage between God and me. I still loved Him, of course. But I didn’t feel so close. Frankly, I didn’t feel like He wanted to be close. Why? What had happened? I hadn’t always felt like this. What went wrong? I wasn’t sure. So, as music swirled around me, I started asking the only One who did know. Immediately, Holy Spirit put the first solution into my mind. I was mad at God–and had been for quite awhile. It’s not that He had done anything wrong. God cannot sin; He cannot do anything wrong at all. He is perfect in all of His ways. But He hadn’t done what I had wanted Him to do–and I was angry with Him about it. Immediately, I realized I needed to forgive God. How does one forgive God? By praying through the forgiveness prayer, the same way you forgive a person. However, when you’re forgiving God, you forgive Him for not doing what you wanted … and you acknowledge that only He knew the right thing to do all along. You tell Him you trust Him, and you confess (and ask forgiveness for) not having trusted Him the whole time. And I felt better right away. But then, Holy Spirit showed me the rest of the solution to my perceived distance from God. Holy Spirit showed me that people had been cutting me down so long that I had come to believe that those people’s feelings, emotions, and lies about me were actually the way God felt about me. Aaaannnd, therefore … I felt like God had abandoned me. And my heart had broken into a million pieces. Remember that these were feelings only. I knew perfectly well–in my head–that God had not abandoned me. I knew that the horrible things people had been saying to me were all lies. NOT from the Lord. NOT true. NOT the way God felt about me. But knowing something in your head is a whole lot different from feeling it in your gut. And when your emotions have come into alignment with a lie–even when you didn’t realize it was happening–it is devastating. That day, during worship, I knew I couldn’t address the feelings in totality at that moment. I knew I would have to get in the Word and re-discover the TRUTH about what God really does think and feel about me, so I could get free of the lie and sense His love again. So that day, I simply asked Holy Spirit to help me sense His love and affection during worship … and He did. It turned into a wonderful, refreshing time in which He encouraged my heart with His love. But the next day, my broken heart and I sat down before the Lord, alone, and I prayed. “Father, I feel like You abandoned me. You didn’t rescue me the way I wanted You to. And I’ve been feeling like all those terrible things people have said must be the way You feel about me. With that, I opened my Bible to the book of Isaiah and began to read. And the Lord touched me deeply–as only He can do. It’s funny. Our Father always wants to minister to our hurting emotions. Our emotions may not be the most important thing; the TRUTH is the most important thing–but Papa really cares about our emotions too. That’s why He sent Holy Spirit, the Comforter, to minister specifically to our broken hearts! So when I opened the door to Him in my prayer to help me with my emotions, He answered. He began to show me the TRUTH of His Word–the exact truths I needed to counteract the lies the enemy had sent against me. Comfort, comfort my people, says your God” (from Isaiah 40:1). “But you, Israel, My servant, Jacob, whom I have chosen, the offspring of Abraham, My friend … ” (Isaiah 41:8). “You are My servant, I have chosen you and not cast you off” (from Isaiah 41:9). “Fear not, for I am with you; be not dismayed, for I am your God; I will strengthen you, I will help you, I will uphold you with My righteous right hand” (Isaiah 41:11). “Fear not, I am the one who helps you” (from Isaiah 41:13). “I am the Lord; I have called you in righteousness; I will take you by the hand and keep you …” (from Isaiah 42:6). “Fear not, for I have redeemed you; I have called you by name, you are Mine” (from Isaiah 43:1). Over and over, verse after verse, chapter after chapter, Holy Spirit ministered to my heart. For every cutting thing the enemy had sent against me, the Lord sent His sweet Word that exactly counteracted it. For every feeling of rejection with which I had been struggling, the Lord sent me His resounding, reassuring, comforting words of love and acceptance. He ministered to my broken heart. And one by one, those hindrances that had left me feeling distant from my Lord fell away. Is your heart broken today? If so, I want you to know that healing for your broken heart is your portion. Comfort is your portion. Complete freedom from misery and from all the lies of the enemy is your portion. Jesus paid for your heart to be healed. He paid for you to know how loved you are with His very blood. He bought and paid for your comfort. His blood paved the way for Holy Spirit to be poured out to comfort you. You don’t have to keep hurting. What does it take to find healing? First, you have to allow God access to your emotions. In my story above, I never would have been able to receive help from Holy Spirit unless I had first gotten real with Him. Praying something like “Father, I feel this way. I know it’s not right. Help me …” goes a long way. I have known a person who won’t allow God to touch their emotions at all. That person actually criticizes modern worship music because it connects with God on an emotional level. That person is going to stay wounded until and unless they allow Father God to touch the places inside them that hurt. If that’s you, you don’t have to worry. Papa’s touch only brings comfort. It only heals. He will only help you, and you don’t have to be afraid of Him. Secondly, you have to be willing to receive God’s truth. When you open your Bible, Holy Spirit will lead you to the exact truths you need that will heal your heart. But if won’t accept God’s Word as absolute truth–and the attacks of the enemy as absolute lies–His help won’t do you a lick of good. If you won’t do that, you won’t benefit from God’s help. Your pride will keep you hurting if you are not willing to humble yourself and believe the truth of God’s Word. 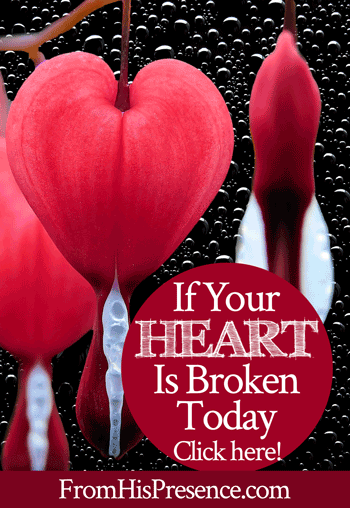 If you have a broken heart today, healing for your heart is your portion. Father God cares about everything. He cares about you. He knows and cares about every bit of minutia in your life. He cares about the big things too. Nothing passes Father’s notice. And He will heal your broken heart if you will let Him. Will you open up your heart to the Lord and receive His truth today? If this word encouraged your heart, please leave a comment below. Would you help me with my work of reaching people for Jesus as a domestic missionary? I need you; we are in this together! This blog, and all of the Kingdom work we do in this community together, are made possible through your partnerships, donations, and product purchases. If you’d like to help, please check out the partnership details and products available for sale here. And, thank you in advance for helping make this blog and everything we do together for the Kingdom possible! Lord Father, thank you for allowing Jamie to bring this message I desperately needed to hear father. Please forgive me for being angry with you for not answering my prayers right now, I know your timing is always perfect, I ask that you search my heart and reveal all the things to me that I need to know so I can begin healing, I need to be able to forgive my family for the attacks on my broken marriage and the feelings of worthlessness. I know those are lies, I know I’m a good mother and this road you have made for me will manifest into something Good because you have promised that all things will work for you good because I love you and I am called according to your purpose. Father, let the Holy Spirit fill me, my home and this atomosphere. You are welcomed all the time. I ask that father you see the attacks the enemy has placed on my husband, my marriage and you say let the heavens come down and bond up in chains these attacks from the enemy. I claim my marriage, I claim my husband to see the Jezebel spirit he’s filled with along with this woman he is with. Save their souls Lord father because he know not what they do. I know you say don’t stand in the way of a sinner. But you’ve given me authority to pray for my husband and I refuse to let him go, please lord release your warrior angels and grabbed my husband from his choices that will bring him further from you. Save my soul for the anger I have towards his woman and for my husband and place a new seed of hope and reconciliation towards my broken marriage. You are the ultimate healer and I ask that your hand be shown in your timing. Thank you father God for everything you are doing on my life, I want to abide in your word, in your truth. In Jesus name I pray, Amen. Keep giving your feelings and words up to God. He hears you and is working on your behalf now! And I am standing in agreement with you on Mathew chapter 18 verse 19 that this will work out to your advantage! Thank you so much! It was very helpful and encouraging! God bless youyou! This is right on time because I feel that way too. In my heart I know that there is nothing that would make me stop loving God or that would make me think He didn’t love me. But it is hard because sometimes I feel like asking why he has led me on this particular walk and why things haven’t yet turned the way I believe he has shown me they would. I believe in my heart that He has something very special up His sleeve and that it must be in His timing, but I must also learn to deal with being disappointed and take that to Him as well so than He can wash me over with His love. Thank you for sharing your testimony. Jamie, I have been feeling the same way. I have been angry with God for a very long time. I have been afraid to admit this to my Pastor because i hear someone else tell her that they were angry with god them not to be. I felt lik I could not be honest with her. I thought being inmate with God is telling him everything in your heart because he already know what is in there. I some time thing that some Pastors also need inner healing. It makes people feel unsafe in churches and it stops the healing that God wants for the person. It did for me for years. I became honest with a Pastor and discounted my emotions this is so sad. Well enough of this. Have a great day. Thank you, Jamie, for sharing this! Our family needs this now more than ever. You are so encouraging and we are so blessed to have you in our lives. am the apple of his eyes. Again thank you. All praises be to God. This word rely you he’s me as I was feeling so abandoned so all alone as if am at a dead end and there is no hope. But glory to God for this blessed assured words it really speaks to me and co firm that am not alone God is always with me no matter what. I just have to believe. Jamie, This is true that sometimes I feel that my prayers are not answered on time … I feel that some people don’t even need to pray but their blessings come right away. I know it is wrong to feel that way. God has His own time and reasons for everything and I just have to trust Him. Thank you for the message… it renewed my spirit that the Lord will always be there for me no matter what. Thank you for your article on healing a broken heart. I also have been feeling disconnected from God. No matter how hard I tried I still could not feel his power . . . 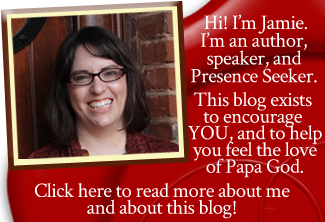 He revealed to me that I had a spirit of broken heartedness from family rejection, abandonment and betrayal. I have worked through forgiving my family . . . Now I have to forgive God . . . Which I have learned through your testimony . . . I possibly felt/thought why does He allow family to treat me like this if He sees and knows everything . . . . I try my absolute best to love, care, and support them and it’s never appreciated, never enough and their actions show . . . They really could care less about me. . . . Just give them what they want/need and get outta their face until the next time. I thank God I never succumbed to the hatred they exhibit toward me . . . And I praise Him now for giving me the Keys to get totally FREE.